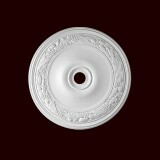 Polyurethane, Contemporary Ceiling Medallion 30" Outside Diameter, x 1" Projection and a 22" Opening. Finished with a smooth, white paintable surface. 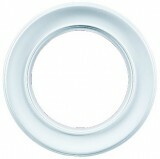 Polyurethane Smooth 32 1/2" Ceiling Medallion with an approximate opening of 4". Polyurethane Ribbon & Reed Ceiling Ring -- 37 1/2" outside diameter, 30 3/4" inside diameter, 3 1/4" thick and a projection or height of 3" from the ceiling. 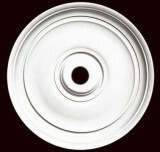 Ceiling Polyurethane Medallion with a simple center, 31" diameter X 2 1/16" projection with an opening 4 1/4". CC-RR-31 Line drawing. 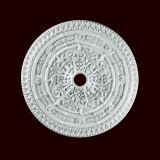 Polyurethane Joleen Ceiling Medallion-- 32" outside diameter, 1" inside opening diameter that can be easily widened on site, 2 1/4" projection or height from the ceiling.